Today, we’re featuring a delicious classic French dessert or snack — pain perdu (French toast). Pain perdu literally means “ruined bread”. In the old days, pain perdu was made to save old bread and crusts. Traditionally, it was also served in the South of France around Easter. Pain perdu is so delicious and moist, nobody will ever know it is done with stale bread. For many, pain perdu brings back such sweet childhood memories — it is a children’s favorite. 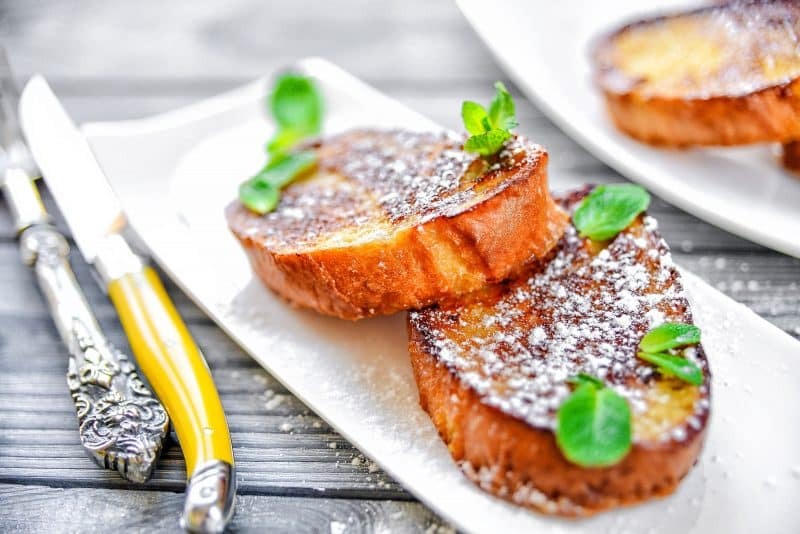 Pain perdu is also a great way to let children see how instead of throwing away bread, you can be resourceful and turn stale bread into a delicious snack or dessert. I still remember when my grandma would recite to us “le respect de pain” (the respect of bread), a text she memorized at school as a young girl. So let’s save our old bread (with this recipe you’ll actually be looking for stale bread!) and make some pain perdu — Art of the Home pain perdu can be done is just five minutes. Check out our easy Art of the Home recipe and Art of the Home suggestions below. Enjoy and bon appétit! In a mixing bowl, beat eggs. Mix in milk and vanilla extract. Dissolve in sugar. Coat the bread by soaking it in the egg/milk/sugar mixture for a short time. Melt butter in a frying pan over medium heat and cook bread slices slowly on each side until the bread becomes golden brown (about 2-4 min. on each side). Dust with confectioners’ sugar and enjoy warm. Toppings: you have so many options. Pain perdu can be enjoyed plain or topped with a spoon of jelly, ice cream, or maple syrup. Fruit toppings: sliced banana, strawberries or even warm apples are delicious on top of pain perdu. Sugar & spices: feel free to substitute confectioners’ sugar with regular sugar or sprinkle on cinamon instead.